The sale grounds comprise an outdoor, paved area and the sale warehouse where all of the product is kept. An information/will-call booth is located at the entry to the sale grounds from the street. Please see the information booth to pick up will-call tickets, to purchase walk-up tickets (when available), to receive free tickets on Sunday, to buy reusable shopping bags, or for questions about sale procedures. The parking lot at the sale, behind the information booth, is reserved for those with disabled permits, and for those picking up purchases in the loading zone. A roped walkway connects the street access with the main sale area. All pedestrians should stay in the walkway. 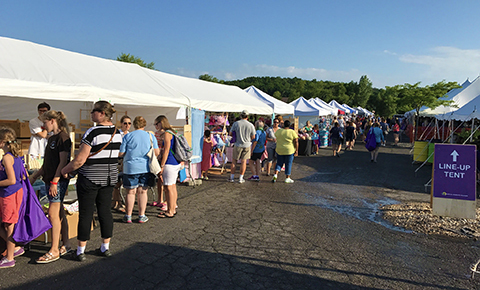 The outdoor, paved area also includes the vendor fair, raffle, silent auction, food vendor, Come and Play area, doll daycare, UPS shipping booth, and the warehouse-entry waiting tent. The warehouse contains all sale items and checkout stations. You may enter the warehouse as determined by your ticket time or number. Read more about warehouse entry and procedure. There will be over 40 crafters on site at the sale. Seamstresses and craftsmen sell 18″ doll clothes, furniture, accessories, and other custom-made items. On Saturday a food vendor will sell food and drinks. 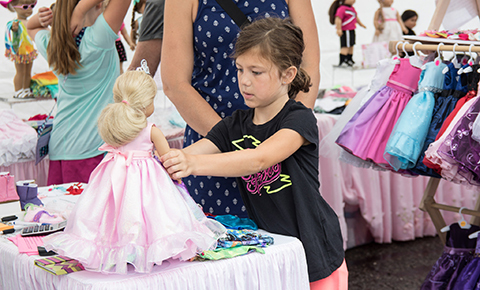 To learn about becoming a sale vendor, please email our American Girl Benefit Sale coordinator. The raffle will include a variety of American Girl items. Tickets are $1 each for a chance to win. All proceeds support Madison Children’s Museum. 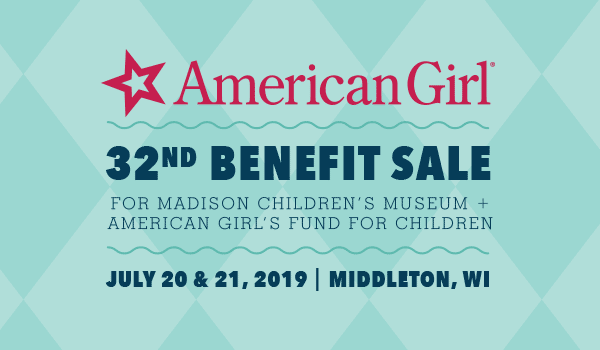 The silent auction typically features American Girl products that are no longer available or not easily purchased. All proceeds support Madison Children’s Museum. Our Come and Play area is a wonderful place for your children to have some creative fun, including making a craft to take home. Bonus: Off-Site Activities at Madison Children’s Museum! We encourage shoppers to visit the museum and experience the wonderful exhibits and activities that you help support with your purchases. 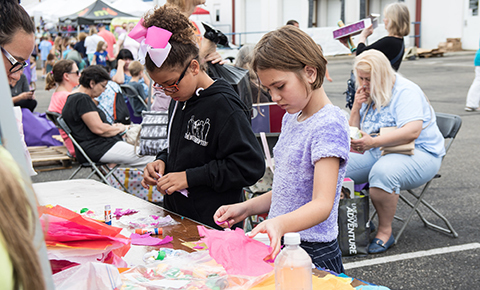 During the weekend of the sale, Madison Children’s Museum often offers activities and workshops created with doll enthusiasts in mind. 2018 event details will be posted here in early summer. There will be food and water available for purchase during the Saturday Sale. We usually have a vendor who sells boxed lunches on Saturday and breakfast type food on Sunday. The vendor generally sells coffee both days. Water bottles are sold at several booths throughout the sale grounds. You are allowed to bring your own food and water onto the sale grounds. We will update this page with food and drink offerings as they become available. Non-gendered porta-potties are available on the sale grounds, including accessible units for those with disabilities. There is also a toilet room in the warehouse that is available upon request for those with specific needs, such as expressing milk. Breastfeeding is encouraged anywhere in the sale grounds, though children under 3 are not permitted inside the warehouse for safety reasons. The sale grounds are outside on a paved surface. The warehouse is inside, and we use large fans, but the space is not air-conditioned. Please keep the weather in mind as you plan your visit and dress accordingly. There are some tents on the sale grounds, but there may not be enough to accommodate everyone in case of rain. The sale will go on, rain or shine, so you may wish to bring an umbrella or other rain gear. A limited number of parking places are available on the sale grounds for those with a current, valid disabled parking permit. The sale grounds have some mild slopes, including the parking area which is on a small hill above the sale grounds. Shuttle carts are available to transport anyone who needs assistance. They cover the sale grounds—from the entrance at the road, along the disabled parking, and to the sale entrance or vendors, and back. If you cannot stand or remain in the line-up tent you may sit in a designated area near the door of the warehouse until your entry group is admitted. As space is limited, other members of your group will need to remain in the line-up tent. Please only proceed to the waiting area when your entry group is admitted into the tent. Wheelchairs and walkers or other mobility assistance devices are permitted in the warehouse. No other wheeled devices, including wagons or strollers, are permitted in the warehouse. You must be able to carry all of your purchases.